Sea snakes anticipate tropical cyclone. 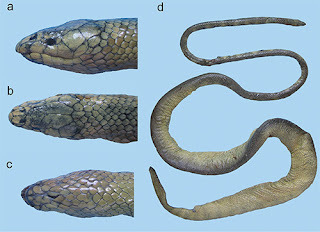 Here, we report anticipatory behaviors of sea snakes and provide the first evidence for a sensory mechanism by which they survive a catastrophic cyclone. Sea kraits (Laticauda spp.) are normally abundant in littoral habitats at Lanyu (Orchid Island), Taiwan but disappeared coincident with falling barometric pressure prior to typhoon Morakot, which impacted the island severely during 7–9 August 2009. The abundance of sea kraits that are visible within the littoral zone correlates with barometric pressure, but not with precipitation or wind speed, which drives the surf. We found very little evidence of direct mortality caused by the storm, and the visible abundance of sea kraits following the storm returned to pre-storm levels. Data suggest that survival of sea kraits depends on the sensory perception of low pressures preceding a tropical cyclone, followed by behaviors which avoid the lethal storm energies potentially affecting this coastal population. Sea kraits likely find refuge in cavernous spaces beneath volcanic rocks of the seacoast. Liu, Y. L., Lillywhite, H. B., & Tu, M. C. (2010). Sea snakes anticipate tropical cyclone. Marine biology, 157(11), 2369-2373. That is an interesting study. Although I love reptiles and know quite a lot about snakes myself but never came across this behavior of theirs. They are quite fascinating.